Rose Coschignano/Pipe Dream Photographer Junior guard Karlee Krchnavi scored six points and collected 12 rebounds in a one-point loss to UNH. Facing a New Hampshire team with only eight active players — six of whom are freshmen — the Binghamton women’s basketball team entered Saturday’s game heavily favored to win. Instead, the Bearcats were in need of a miracle in order to triumph over the Wildcats, facing a six-point deficit with just 10 seconds remaining in the fourth quarter. In the midst of an anomalous shooting game for BU, the stars appeared to align. A 3-pointer from freshman guard Hayley Moore cut UNH’s lead to three. On the ensuing inbound, a steal from Moore gave the Bearcats an opportunity to tie the game. Having a timeout but deciding not to use it, Binghamton exploited the chaos with a layup from freshman guard Annie Ramil to cut its deficit to one with only 2.9 seconds remaining. Following two missed free throws by UNH freshman guard Kari Brekke, Binghamton elected to use its timeout to advance the ball to the frontcourt with a chance to win. After the Wildcats effectively denied Binghamton’s first two options on the inbound, BU inbounded the ball to Ramil in the post, who lost the ball against a strong interior defense. The Wildcats (6-18, 3-8 America East) escaped Vestal with an impressive victory, edging out the Bearcats (9-15, 4-7 AE), 54-53. Essentially every Bearcat, with the exceptions of Moore and junior guard Karlee Krchnavi, struggled from the field. Binghamton’s three leading scorers this season — Carmody and junior guards Kai Moon and Carly Boland — shot a combined 9-for-39 from the field, helping quantify BU’s woeful performance. The Bearcats shot 30.8 percent from the field and 13.3 percent from 3-point range as a team in the loss. Moore helped ignite Binghamton when she checked in off the bench, relieving Moon, who struggled to get in a rhythm due to foul trouble. Moore’s ability to push the pace and hit the Bearcats’ only two 3-pointers helped provide pacing and spacing that Binghamton needed in the game. She and Krchnavi each shot 3-of-5 overall on Saturday, an efficient display in an otherwise gritty game. Krchnavi and Carmody both made an impact on the game, both on the glass and defensively. Krchnavi grabbed a game-high 12 rebounds while recording two steals and a block; Carmody snagged 10 boards in a double-double effort, adding 12 points, three steals and two blocks. 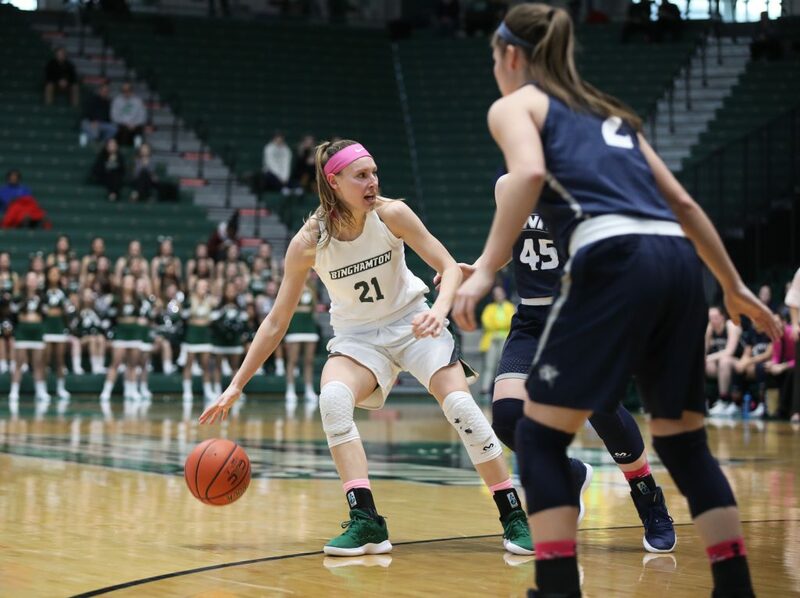 Binghamton struggled to get consistently productive minutes at center, as sophomore forwards Kaylee Wasco and Olivia Ramil each struggled with foul trouble. Shapiro Ord adjusted by turning to Olivia Ramil at the five down the stretch, giving BU a lineup that showcased versatility and mobility on both ends of the court. With Ramil checking in for Wasco with 52 seconds remaining, Binghamton outscored the Wildcats by six points and had an opportunity to come out on top with Ramil closing out the game. After a disappointing defeat, Binghamton shifts its focus to Wednesday’s road matchup with last-place UMBC. Tipoff from the Retriever Activities Center in Baltimore, Maryland is scheduled for 7 p.m.